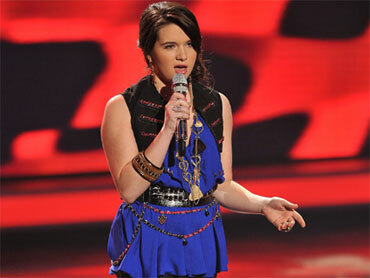 Garcia, Stevens Cut from "American Idol"
"American Idol" viewers were cruel to Andrew Garcia and Katie Stevens. The 24-year-old musician from Moreno Valley, Calif., and the 17-year-old high school student from Middlebury, Conn., received the fewest viewer votes Wednesday on the Fox singing contest. Both failed to wow the judges with Elvis Presley tunes Tuesday. Stevens received a mixed reaction to "Baby What You Want Me To Do," while Garcia was lambasted for "Hound Dog." "I'm glad I've been through what I've been through," Garcia said after his dismissal. Stevens and Garcia were both sent packing on the double-elimination episode because the judges saved 26-year-old personal trainer Michael Lynche of Queens, N.Y., last week. "Idol" host Ryan Seacrest revealed that Lynche, who impressed the panel Tuesday with a low-key rendition of "In the Ghetto," was not one of the bottom-three vote getters on Wednesday. Garcia was ousted at the beginning of the show, but Stevens didn't learn her fate until after performances from two past "Idol" contestants. Brooke White, the seventh season's fifth-place songstress, crooned Presley's "If I Can Dream" with model-singer Justin Gaston. Adam Lambert, the eighth season's runner-up, performed his own "Whataya Want From Me." "If you want to win this competition, you've got to wake up," Lambert advised. The other finalists remaining in the competition are Crystal Bowersox, 24, of Toledo, Ohio; Lee Dewyze, 24, of Mount Prospect, Ill.; Aaron Kelly, 17, of Sonestown, Pa.; Siobhan Magnus, 20, of Marstons Mills, Mass. ; Casey James, 27, of Fort Worth, Texas; and Tim Urban, 20, of Duncansville, Texas. The top seven singers will tackle inspirational tunes next week.